First I lay down pieces of wood on the floor to kinda visualize how I wanted it to look. I had measured the wall in the living room where I wanted it to go so I knew how wide I wanted it to be. I went online to see what the standard height of one is. I didn’t make it high like some since we don’t have high ceilings in our house. It’s hard to tell in this picture but I kept laying down boards and cutting them to fit how I thought it looked best. Next I laid them all down again exactly how I wanted them and used an air nailer to pin the boards together. I also always glue everything with a good wood glue. It was pretty heavy when all the boards were fastened. I didn’t attach the big mantle shelf until later. The next step was painting it. I carried it in on the deck to paint. After applying putty to all the holes, I gave it a couple coats of white satin paint. Then it was ready to install! I did distress the edges and ended up making doors to fit into the opening. I thought it was just too much of a give away that there’s not a fireplace there without the doors. Hi, found this on Pinterest. Simple and sweet, just what I had visualized! Hoping to get one made from pallet wood soon for a perfect little spot in our bedroom. DH is the builder and I'm the painter/finisher. Thanks for the tutorial! I love this and think I will try my hand at it. Love your work! I found an antique oak fireplace mantle at the thrift store for $49. 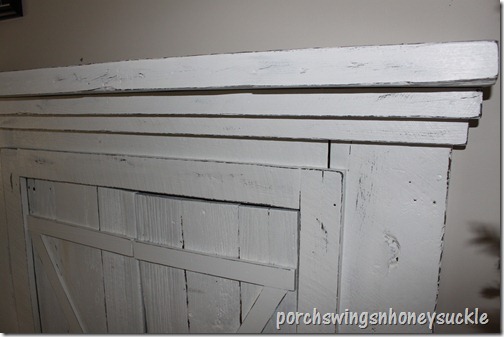 I added some old doors off an antique cabinet, behind the opening of the fireplace, painting it white! I don’t have your building skills. You are so creative!! Love ur videos on You Tube!